As the star-studded US festival Coachella ends, and high street stores begin to frantically embellish every garment with Aztec prints and an abundance of fringing, we are reminded that the summer festival season is fast approaching. In fact, the coverage of California based festival Coachella spiked figures for UK festival ticket sales. Although Rockness has been confirmed as cancelled for the second year running and Radio One’s Big Weekend has moved on to the next city, there’s still plenty of choice in Scotland. The biggest festival in Scotland, T in The Park, takes place between 10th and 12th of July and boasts a multitude of big-name acts including: Kasabian, Daivd Guetta, Sam Smith, Avicii, The Libertines, Noel Gallagher’s High Flying Birds, Kodaline and Twin Atlantic. This name-dropping does, however, come at a price with weekend camping tickets currently on sale for £205! TITP 2015 will be the first to take place at Strathallan Castle since the festival relocated from Balado Airfield. The Wickerman Festival is held from 24th – 25th July in East Kirkcarswell in South West Scotland. The line-up features Tom Odell, Example, Lulu, Squeeze, The Waterboys, and The Sonics. A weekend camping pass from Thursday to Sunday very nearly slices TITP in two, fetching just £110. 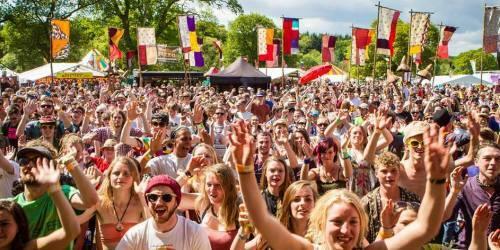 The Eden Festival, held near Moffat in Dumfries and Galloway, takes place between 11th and 14th June and was originally an area of The Wickerman Festival. Some of the acts which will play include Grand Master Flash, The Cat Empire, The Skints, Portico and Aphrodite. Weekend camping tickets are on sale for £99. The Riverside Festival, hosted by Pressure and Electronic Frog, takes place 29-30th May in the Riverside Museum, Glasgow. The line-up includes acts such as Siriusmodeselektor, Len Faki, Slam and Carl Craig. Weekend tickets cost £81 and are available from Hillhead Book Club without a booking fee. Another local, and slightly more student-friendly, option is Live at Glasgow. The festival takes place on Sunday 3rd May across ten different venues in Glasgow city centre. Musicians featured on the line-up include Django Django, The Staves, The Thurston Moore Band, Honeyblood, and Strathclyde’s own Declan Welsh. And tickets cost a mere £23 for the day! One often forgotten festival is the Edinburgh Fringe Festival which takes place throughout August across roughly 300 venues in the city centre. The Fringe hosts numerous musical events which feature a variety of styles such as folk, rock, acoustic, classical, and a cappella. What’s more, tickets are often extremely affordable with some completely free of charge.